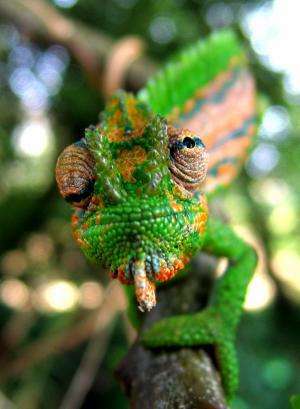 How do chameleons and other creatures change colour? When most people think of colour change, they think of octopuses or chameleons – but the ability to rapidly change colour is surprisingly widespread. Many species of crustaceans, insects, cephalopods (squid, cuttlefish, octopuses and their relatives), frogs, lizards and fish can change colour. They all have one thing in common: they are ectotherms (animals that cannot generate their own body heat in the same way as mammals and birds) and only ectotherms have the specialised cells that enable colour change. Colouration in animals is produced by reflection and scattering of light by cells and tissues, and by absorption of light by chemical pigments within cells of the skin. In ectotherms, cells containing pigments are called chromatophores and are largely responsible for generating skin and eye colour. 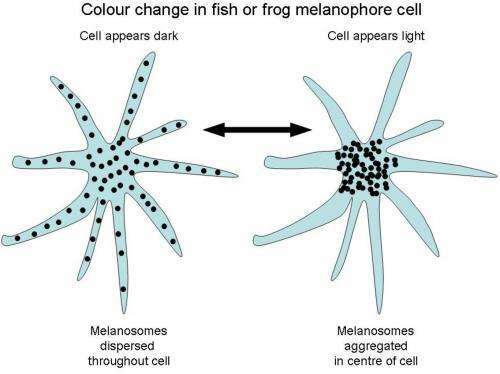 The melanophores play a crucial role in colour change. They are large, star-like cells with long "arms" (dendrites) that extend towards the skin's surface. Colour change occurs due to the movement of "packets" of melanin pigment (melanosomes) within the melanophores. When melanin pigment is aggregated within the centre of the cell, the skin appears very pale, whereas when it is dispersed through the arms of the melanophores towards the skin's surface, the animal appears dark. Because the arms of the melanophores extend between and over the other types of chromatophore (generating yellows, reds, blues, etc. ), varying the degree of dispersion of the melanin can conceal or reveal those chromatophores, thereby varying the animal's colour. Colour change may also occur due to changes in the spacing of the stacks of platelets or crystals within the iridophores, which changes the way they reflect and scatter light, and therefore their colour. In cephalopods, the structures known as chromatophores are very different to those of vertebrates. Cephalopod chromatophores contain a pigment-filled sac, surrounded by radial muscle fibres. These muscles contract to change the size and shape of the pigment-filled sac (e.g. thin, flat disc vs small sphere), resulting in the near-instantaneous and dramatic colour change. When the pigment sacs are contracted, these other cells are revealed, changing the colours we see. In chameleons, colour change occurs due to the movement of pigments within chromatophores, whereas in cephalopods, colour change occurs due to muscle-controlled "chromatophore organs" changing the shape of pigment sacs. Rapid colour change may occur due to various "triggers" including temperature or light (a reflexive response via light-sensitive receptors in skin). That's why chameleons are very pale at night when asleep but darken as soon as a torch is shone on them (and only on the side with the light shining on it). Most importantly, animals change colour in response to their surroundings (including variations in background colour, presence of predators, mates or rivals). They need to assess their surroundings so that they know what colour to change to. Information about an animal's surroundings (from the senses) is processed by the brain and the brain sends signals directly, or via hormones, to chromatophores. Colour change is a very useful ability. Given that colour-changing animals cannot generate their own body heat, colour change can help animals to regulate their body temperature. So, when cold, a lizard may be dark because dark colours absorb more heat, whereas when hot, a lizard may become very pale because light colours reflect heat. But perhaps the two most important functions of colour change are camouflage and communication. Colour change allows animals to flash bright colours to warn rivals or attract mates, while remaining camouflaged at other times. 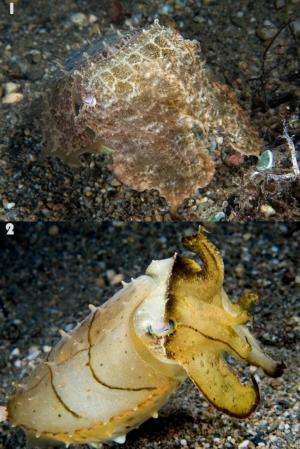 Male giant cuttlefish use moving waves of black and white stripes in aggressive and courtship displays (see video above), while chameleons show an impressive range of conspicuous colour patterns. Yet, when they are not communicating to each other, they are superbly camouflaged. Colour change allows unparalleled flexibility, which is perhaps why we find it so fascinating.